Put aside the face that the government can’t even censor books properly, let alone web pages that churn out at a much higher rate. Consider books that the government has banned like Irshad Manji’s Allah, Liberty and Love–these books were easy, since anything with Allah in the title would get heads turning over at the Censorship bureau. However, consider books that under the very same logic should be banned but aren’t–books like The God Delusion by Richard Dawkins. Richard Dawkins has been at the frontlines in the war between Atheists and the religious, he has countless attacks not just on Islam but on every major religion of the world. . A simple search on youtube reveals hundreds upon thousands of short videos and sound clips where he utterly destroy religious beliefs including those of Islam, and don’t be fooled by his quaint English accent, it merely betrays his inner zeal for the complete annihilation of religious belief in the supernatural. One of his famous salvos in this ‘war’ is a book entitled The God Delusion which seeks to show how “religion fuels war, foments bigotry and abuses children”. You would think that such a book would be banned in Malaysia, since books insulting Islam are banned, wouldn’t a book insulting the fundamental notion of God be banned as well? 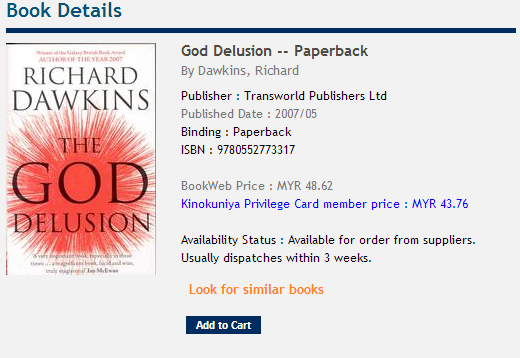 Not only is The God Delusion un-banned in Malaysia, it’s easily available from both MPH and Kinokuniya. In fact, I’ve seen this book sitting on the religion shelf next to Bibles at the Popular Bookstore in Sunway–quite interesting for a book that claims to eviscerate all proof of God. In a country where broadcasters are made to place religious disclaimers on biographies of the Pope, to prevent Muslims from being ‘confused’–you’d think a book seeking to ‘destroy the notion of God’ would would at least fall into a mandatory disclaimer category–but yet there it is, freely available to any Malaysian with Rm45 plus shipping. Don’t you find it amusing, that a book that specifically targets Islam is censored in Malaysia, but a book that targets the whole notion of God itself is allowed through. Even more amusing is that the fact, that after years of this book being readily available to members of the public, not many Malaysians (Muslim or otherwise) have been ‘confused’. Perhaps, we’re more matured than we think–either that we don’t read enough books. I was shocked to find the God Delusion sitting on the shelves at MPH and a few other book-stores. I was actually about to order a copy online when I saw it. As you mentioned (and I think this is an important point), the book is always in the “religion” section, right next to books about strengthening your faith and why you need God in your life. It seems to me that whatever censorship happens in Malaysia only happens at face value. If the word “Allah” is in the title, then a red flag goes up, but a book entitled “The God Delusion” is just fine. I don’t think the people responsible for the censorship of books here in Malaysia actually read what the books are about. I’m confident that if presented with the cover page of the “The God Delusion” book, they would pass it on just fine. They wouldn’t bother turning the book over and taking a glance at the summary. There are a few other god-related controversial books that seem to have passed the radar, but those end up in the Science or other sections. The God Delusion has always been and will remain in the religion section, for some reason. In a way, that is a good thing. First, it shows how ridiculous the censorship bureau really is. Second, it lets people read more books! Books that their own government would normally be afraid of letting them touch. Guess what? The God Delusion book is often sold out (and then restocked) at the book stores. I find that heart-warming. Human curiosity beats everything else. The reality is that the censorship bureau is fallible, we know it to be fallible and they are after all human. But the way in which they strut their stuff and the powers that the hold seem to suggest that they believe themselves infallible and unquestionable, and to me that’s the worst form of censorship. Yeah, I was indeed, how do I say it?…”pleasantly surprised” when I saw it on the shelves at MPH. Irony is MPH used to be some Christian owned bookshop if I am not mistaken? Even more ironic was I found it at the political section. MPH stood for Malaysian Publishing House…not sure if it was ever Christian owned, but it just goes to show no one is really vetting the book categories. Keith, why would you want any book banned, especially The God Delusion? Isn’t it time for the world to rise from its ancient cloister of ignorance and face the world with courage and honesty? Why fear knowledge? Contrary to what many religions teach (especially the Abrahamic religions) they are not a uniting force, but instead they drive the Balkanization of populations and cultures and make war much easier. One’s religious beliefs is, most often, a matter of happenstance. Its all a matter of where one is born—into which society, which religion, which family. A child is born neither Christian, nor Jew, nor Muslim, nor atheist, nor an adherent to any other brand of religious or philosophical order. A child is born a human being with an ability to learn and from this raw material society builds her walls of prejudice, nationalism and religious certitude. One may say that the problem is only fundamentalism, but it is exclusive religion, itself, that inevitably breeds fundamentalism with its thundering warhorses of ignorance, xenophobia and hate. All Dawkins is doing is to point out fundamental facts of logic and physics. Sound’s cold? No. It’s exciting to discover new things and to dispel mind-blocking myth. Dawkins encourage people to understand that we are basically all the same, made of the same stuff, but growing up in different societies and cultures, being taught our particular myths that form in us a sense of territorial imperative that must be defended. We are capable of reason. We need to use it to closely examine all beliefs with boldness. Sure, postulate the existence of (s). Even believe such a being to be true. But, what then? Build a life of prejudice, nationalism and religious certitude based on that one idea?